The TAG Bench Mounted Orbital Pipe Saws are the low cost and practical solution to cut almost all types of metal pipe. Cutting is executed by manually rotating the machine around the pipe. The pipe is cut with one rotation. It is powered by a powerful and sturdy electric motor equipped with speed regulator. The pipe saws produce a square, burr-free cut that does not require any further dressing. Four models are available in the range, the TAG OPS R4 (¼″ - 4½″), the TAG OPS R6 (3" - 6"), the TAG OPS R8 (6" - 8") and the TAG OPS R12 (8" - 12"). 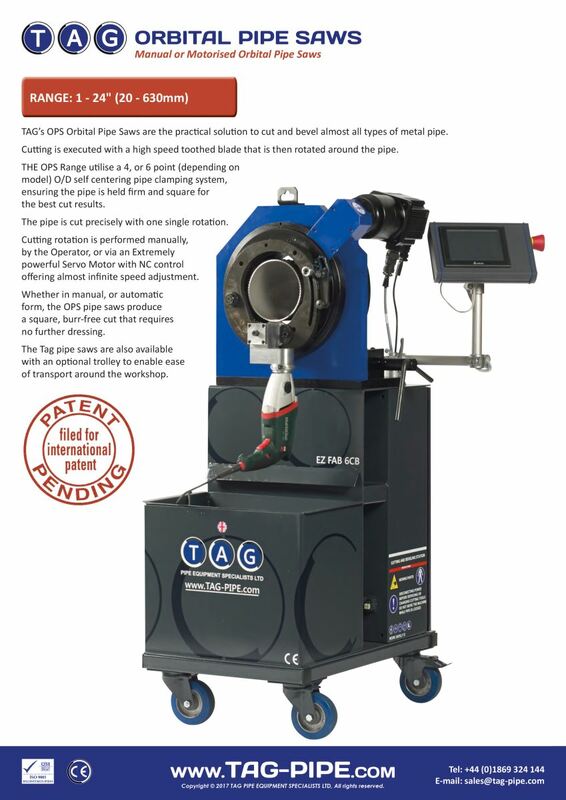 TAG’s Pipecut Orbital Pipe Saws (OPS) are the practical solution to cut and bevel almost all types of metal pipe. 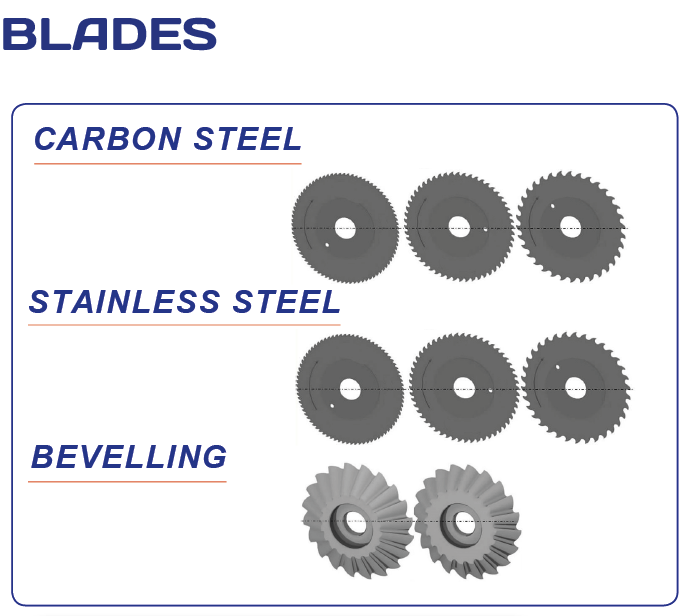 Cutting is executed with a high speed toothed blade that is then rotated around the pipe. 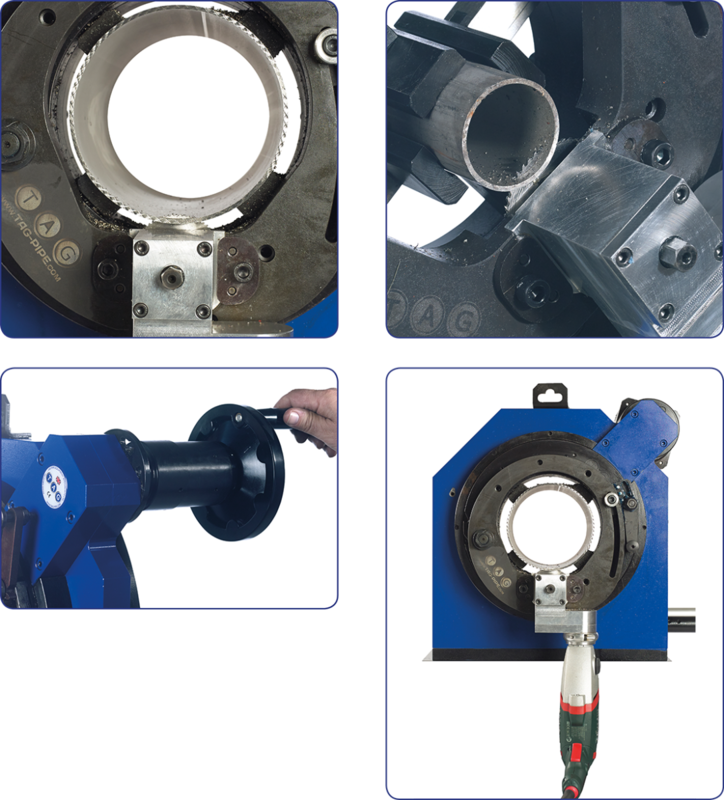 THE OPS Range utilise a 4, or 6 point (depending upon model) O/D self centering pipe clamping system, ensuring the pipe is held firm and square for the best cut results. The pipe is cut precisely with one single rotation. Cutting rotation is performed manually, by the Operator, or via an Extremely powerful Servo Motor with NC control offering almost infinite speed adjustment. Whether in manual, or automatic form, the OPS pipe saws produce a square, burr-free cut that requires no further dressing. The TAG pipe saws are also available with an optional trolley to enable ease of transport around the workshop.